Germany based progressive power metallers BLIND GUARDIAN recently re-released their first four studio Albums. Today they start the pre-order for the next reissues, Imaginations From The Other Side, Nightfall In Middle-Earth and A Night At The Opera, which will be released on November 30th via Nuclear Blast! The back-catalogue has been remixed and remastered, and is available in 2CD-digi and 2LP gatefold vinyl format with individual colors. 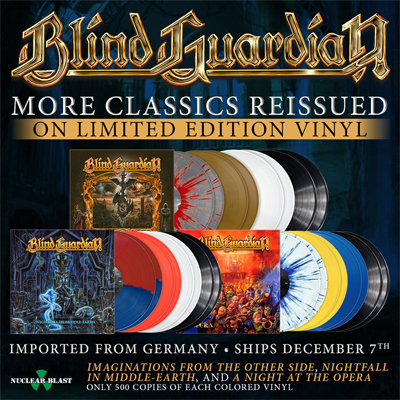 More re-issues are due to follow, in total there will be 10 BLIND GUARDIAN re-releases.